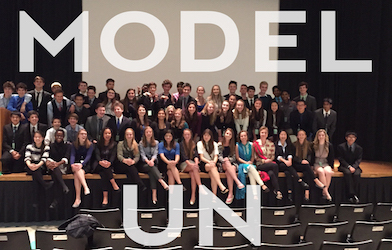 On November 12 and 13, sixty Upper School students traveled to UW-Parkside to collaborate with over 150 students from Southeast Wisconsin at the Model United Nations Climate Negotiations. This year, students simulated the approaching Paris negotiations concerning climate change within the United Nations. In their committees, Prairie delegates tried to negotiate targets for climate stability, the goals and action plans for the newly developed Green Climate Fund, and the implementation of Intended Nationally Determined Contributions. Students debated, spoke extemporaneously, gave formal speeches, and wrote resolutions with their fellow delegates, honing valuable skills. Prairie delegates won awards in all categories, including Oratory, Speech Content, Outstanding Resolution, Outstanding Delegate in a committee, and the coveted Outstanding Delegation of the Model (the Kingdom of Saudi Arabia and Bangladesh tied for Outstanding Delegation). Our sixty diplomats represented themselves and their school with distinction. Hopefully, the sixty delegates will move forward as climate activists and diplomats in future years.